Square trampolines are in-demand items that bring smiles and excitement to the faces of families around the world. It’s not uncommon for the consumer purchasing the trampoline to return to fond memories of their own trampoline as a child. Of course, this doesn’t meant that children are the only family members who enjoy bouncing around outdoors. Teenagers may take to the trampoline for more practical reasons if involved in gymnastics, and adults enjoy the aerobic benefits and stress relief offered by the trampoline. Using a trampoline can also become a social gathering. It brings together friends and family members looking to enjoy the beautiful outdoors as they show off their jumping skills and tricks on the trampoline. Who can jump the highest? Who can do the coolest trick? These questions often arise and are met with fun responses and playing that can last for hours. At a children’s birthday party, the importance of a trampoline is made especially clear. Young ones flock to the trampoline and once they begin jumping, it’s no easy task to divert their attention from the magical jumping pad. It’s interesting to note that beyond every bounce, most people do not stop to consider the important details of what makes a trampoline so special. As an intricate piece of equipment, it has been constructed according to guidelines that are meant to provide the best of safety and endurance. Likewise, the shape of the trampoline is also of major importance. 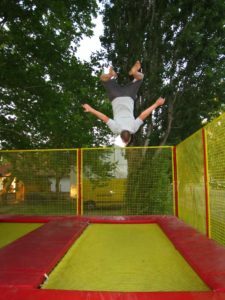 Most trampolines will be square or round in shape and there are various benefits to each. For many, the square trampolines are the best selection because they allow for more jumping room without taking up additional space in the yard and can support a good bit of weight. On square trampolines, there is at least 20% more space to jump, creating more room for fun and delight. 0.1 So What Are Square Trampolines? 0.1.3 How Do You Care for Your Trampoline? 0.2 What Are The Advantages and Disadvantages of Square Trampolines? 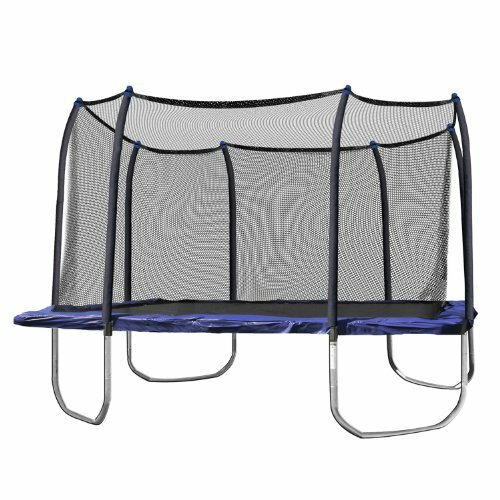 0.2.1 Why Do Trampolines Need Enclosures? So What Are Square Trampolines? By geometrical definition, the square trampoline features four straight sides that are equal in length. There are also four right angles. The level of equality offered by the square frame has provided many benefits for trampoline users throughout the years. Honest to its name, square trampolines are made in the same shape as a basic square. The most common trampoline shape besides the square is the round trampoline. As previously mentioned, round trampolines tend to offer less room to jumpers, but they do provide softer jumps and lighter bounces. Having fun tends to be the reason we think of when it comes to using the trampoline, but there are serious benefits that the equipment offers to users of all ages. In the age of technology, an increasing number of children tend to stay indoors without exercise. A lack of exercise has been proven to contribute to health issues such as obesity and shortened attention spans. When parents buy a trampoline, it gives children an exciting reason to play outdoors and be active. An additional benefit is that playing outside allows children to experience the joys of nature, which also benefits the body. Science has shown us that time spent in nature enhances our mood and boosts immunity. More time spent on the trampoline also gives us the emotional benefit of bonding with children, helping us to learn more about one another. Anxiety and stress can also be relieved by staying in motion on the trampoline. The main reason is because jumping up and down on a trampoline makes us feel happy and carefree. We feel youthful and free and take the time to simply live in the moment. Exercise professionals and workout enthusiasts have also taken notice of the trampoline’s healthy effects. Aerobic programs now exist that include the use of a trampoline because it quickly warms up the body. Still, not everyone has to use a routine to get their heart pumping on a trampoline. Simply jumping increases the heart rate and gives you a workout. As with many important purchases, a trampoline is an investment that will be long-lasting, but will also require upkeep. Paying close attention to the details of the frame and the quality of the springs in your trampoline model holds major importance, as these parts tend to last the longest. On the other hand, the safety pads and the jumping mats tend to need replacing every five years or so. While some safety pads and jumping mats may last longer, replacing them every five years remains as a good measure of precaution and safety. Replacing both of these parts is easy and inexpensive, and the majority of trampoline owners do not feel inconvenienced due to the time between replacements and the ease of the replacement process. How Do You Care for Your Trampoline? Check your trampoline for issues before use. Ensure the safety of everyone using the trampoline by examining it for any problems, including tears and wearing that could make jumping dangerous. Remember to check for debris that could injure the skin. Jumping on a trampoline with shoes on can cause the material of the jumping mats to wear away more quickly. Wearing shoes can also injure other jumpers. Protect your bare feet and fellow jumpers by ensuring that dangerous debris won’t be on the mat. Be considerate of the sun when placing your trampoline. Direct and prolonged exposure to sunlight will cause damage to a trampoline and can make it uncomfortably hot. Position the trampoline in the shadiest spot of the yard, if possible. Learn the proper storage methods for a trampoline. Your trampoline does not have to be exposed to the elements of nature year-round if it will not be in use. Store it away from dangerous objects and weather in a cool, shaded, location. Be aware of flammable objects in the yard. Grills, bonfire areas, and similar spots where fire will be used should be far from your trampoline. Know the importance of rust resistance. Rust weakens metal and is a health hazard. When choosing your trampoline, seek out rust-resistant material. Prepare your trampoline for harsh weather. Is your region prone to constant sun, rain, heavy winds or snow? All of these can damage your trampoline. To prevent this inconvenience, a protective cover is a valuable investment that will shield your trampoline from the weather and add weight that will keep it held in place. In cities that are especially windy, an anchoring kit may be the best option to keep your trampoline secure. What Are The Advantages and Disadvantages of Square Trampolines? The main advantages that customers enjoy with square trampolines are the extra jumping room and the ability to bounce quite high. Extra jumping room lets you share the fun, and the high bouncing abilities can aid you in your coordination efforts during your bouncing. 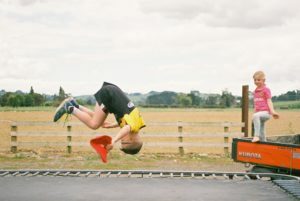 While the high bouncing is an exciting feature of the trampoline, it can be a disadvantage to young children who could easily lose control as they attempt to jump high. Small children often have difficulty deciding when to slow down, especially when having a good time. For many parents, this is a cause of concern and can lead them to worry as a child plays. Why Do Trampolines Need Enclosures? 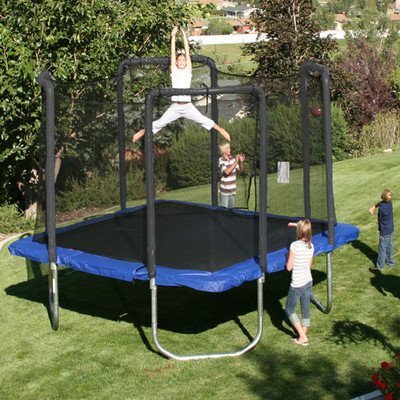 Surprisingly, many trampoline owners have overlooked enclosures, or are not aware of their importance. Yet, to provide safety to all trampoline owners, many brands now include enclosures as part of the make of the trampoline. Trampolines are fun, but people can hurt themselves when jumping so high. Every trampoline should have an enclosure for its important safety advantages. The net of the enclosure is strong enough to protect children and adults in the event someone bounces too high and can no longer balance themselves. Despite its strength, the enclosure net is not harmful to anyone who collides with the material. Of the many square trampolines on the market, these are the best square trampolines for sale. All of these models are trusted by customers and manufacturers because of their commitment to upholding high standards of safety and reliability. 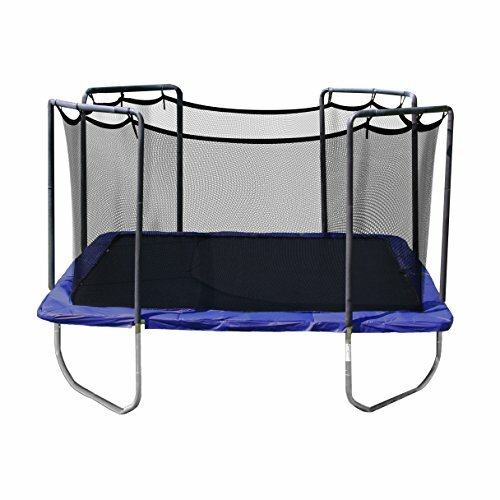 Square trampolines may be similar in shape, but they are unique in their construction features and appearance. With their spaciousness and diversity, it’s hard to go wrong when choosing a square trampoline for your home. Just right for the active family, this model is a customer favorite that’s built to last. 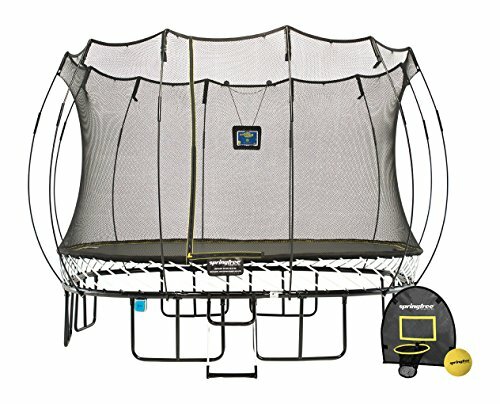 Compared to round trampolines, this 13’ square trampoline offers 35% more jumping room than a 12’ round and 10% more jumping room than a 14’ round trampoline! A favorite of parents worldwide, this Skywalker model is made to keep everyone safe and comes with a warranty to ensure your satisfaction. Relax as you watch the little ones spend the day playing on this blue trampoline. Weight support up to 250 lbs. Safety and high bounce is what this model is all about. The Springfree 11’ Square Trampoline is the ultimate in safety and durability and can be left out all year long! In summary, you’ve probably noticed that trampoline purchases need quite a bit of consideration, and upkeep should be kept in mind both before and after you buy the product. When buying your trampolines on sale, you must consider your lifestyle, the weather, who will be using the trampoline, and the best area for it in the yard. A trampoline requires maintenance, but it is not inconvenient. They are a very good investment, but you have to be able to choose the right shape and size for your family. When you buy a square trampoline, you save space in your yard while simultaneously having more space for jumping on the trampoline itself. In a household with children aged 6 and above, square trampolines are a perfect choice. 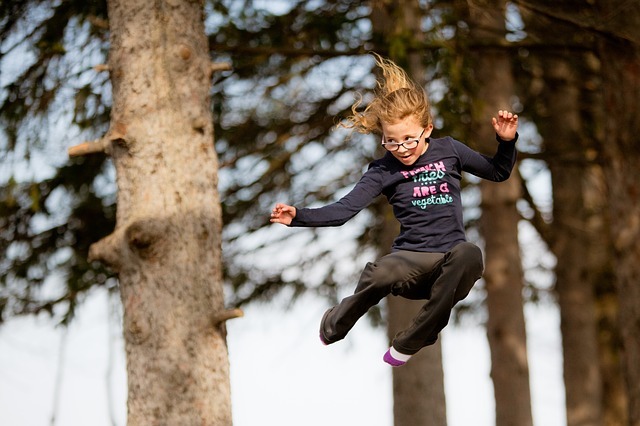 For children younger than 6 years old and those who are uncoordinated, square trampolines may present a challenge, but its benefits far outweigh the drawbacks. Trampoline parts and accessories are very important. As you examine the trampoline you’re considering for purchase, always ensure that rust resistance is a detail of the frame. Protect your trampoline from the elements with a cover or anchoring kit depending on the impact of wind in your area. It will always be worth the investment to go along with your trampoline. Do routine checks in case of any issues. Though, with a high quality brand, you are far less likely to have any problems. Trustworthy brands are safety tested and approved for quality, and many come with warranties. For an extended amount of time, these warranties protect against various issues related to the product, but they can also protect against unexpected circumstances that may damage or ruin your trampoline. Price is always a factor when deciding the best trampoline to buy. Consumers hoping to buy a square trampoline for sale can usually find a trampoline that is both affordable and of high quality if they have an idea of where to look and what to look for. Shopping for square trampolines for sale will be exciting, but remember to review your budget and decide the key features that are most important for your square trampoline.